In a large pot combine fried onions, turmeric, lentils, kidney beans, chickpeas and chicken broth. Cook on medium heat for 20 minutes. 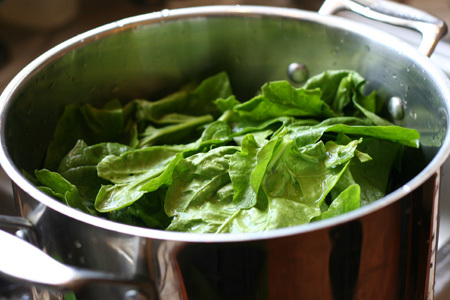 Open the lid, slowly stir in spinach and cook on medium heat for 10 minutes more. Lower the temperature to “low” heat, add in noodles, salt and pepper and cook for final 10 minutes. Add more water if necessary. Optional – garnish with a dollop of kashk or sour cream and top with nana dogh (mint oil). Heat oil and mint in the microwave on high for 1 minute. Set aside for 5 minutes to allow oil to absorb mint flavor. Done! one of my favorites that I haven’t had since I was very young…. thanks for catching this! I’ll change it to be totally vegetarian-friendly!